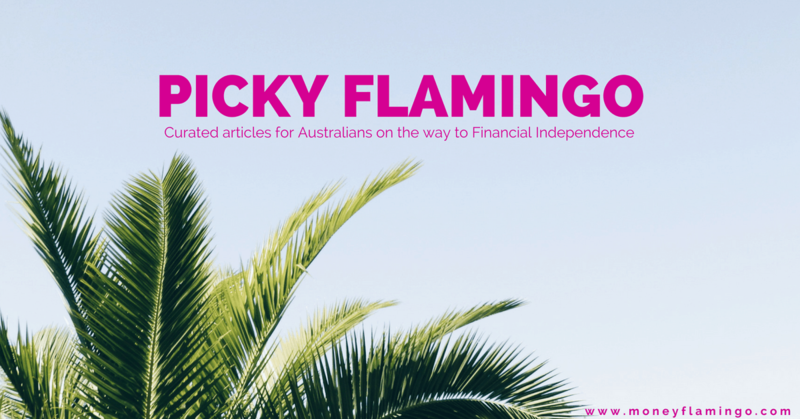 Picky Flamingo is a collection of the best financial independence and personal finance articles I’ve come across during the past week. Expect most of the articles to be from Australian contributors, but you will also find some great international content. The articles cover the themes we talk about here at Money Flamingo - investing, financial independence, early retirement, personal finance, frugality, lifestyle, and happiness. Picky Flamingo is published every Saturday morning. If you would like my weekly picks to be delivered to your inbox, make sure to sign up for the newsletter. Happy New Year and welcome to the first edition of Picky Flamingo for 2019! Today we have some great content from new Aussie FI bloggers for you! Picky Flamingo is a collection of the best financial independence and personal finance articles I’ve come across during the past couple of weeks. We focus on articles from Australian contributors, but you will also find some great international content. Picky Flamingo is a collection of the best financial independence and personal finance articles I’ve come across during the past two weeks. We focus on articles from Australian contributors, but you will also find some great international content. Picky Flamingo – Weekend Reads (01/09/2018) – Another Mega Edition! Picky Flamingo – Weekend Reads (18/08/2018) – Mega Edition! How to Retire Early with a Locked-In Pension by Millennial Revolution: I didn’t think I would ever see an article from non-Australian bloggers on how Super fits in with FIRE. But here it is!